Fiddler 2 is a freeware Web Debugging tool used primarily for debugging & capturing of sessions, Headers, Cache-modules , JSON, XML view of Web apps. No only for Windows Client/Server/Phone enviornment , it’s highly recommended for capturing web sessions in iPhone/iPad devices also. You can download the tool freely from the web & go through its tutorials at http://www.fiddler2.com/fiddler2/ . In this article, we will see how Fiddler 2 helps us to capture traffic in debugging Windows 8 Metro Style Apps in Windows Developer Preview environment. First of in Fiddler 2 tools you need to check the Tools -> Options -> Connections -> Check Allow Remote Computers to Connect . 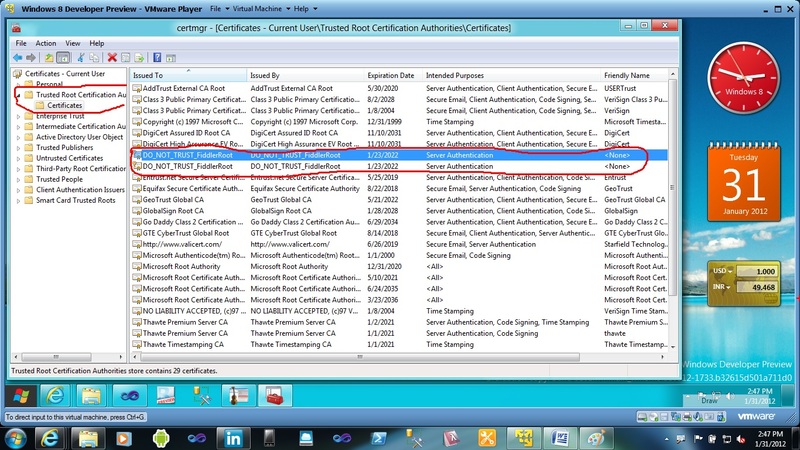 Next , set the decryption of HTTPS traffic for Fiddler & allows Fiddlers certificates to install on your Windows 8 developer preview certification manager. Click on Tools -> Fiddler Options -> HTTPS -> Check Decrypt HTTPS traffic . It will prompt for the popup for certificate installation. Click Yes to follow the installation of Fiddler 2 certificate. Click Yes to install the certificate in Trusted Root Certificate Applications. Now check the Certificate manager by typing Windows + R & type certmgr.exe & open Trusted Root Certificate Application & under the root , Click Certificate. Open the Fiddler 2 Certificate. Now , Fiddler 2 can capture traffic sessions for Windows 8 Metro Style Apps debugging too. So , lets open a Metro Style apps in VS 11 Developer Preview & capture traffic sessions in fiddler 2. Open the Inspector section to preview the debugging overview & session details of Windows 8 Metro Style apps in Fiddler 2. With Consumption of Live Data the apps preview the UI according to XAML designing format like GridView,ListView,FlipView with streaming videos. Along with that, they have nice app bars which helps to add application functionalities making Metro Style apps for User-Interactive. In this example , We will develop a Metro Style Apps which helps to preview Live Stream Images from Bing API in XML/JSON with REST Services. The same can be also consumed by building a simple WCF Services with OData Feed in AtomPub/XML Format. 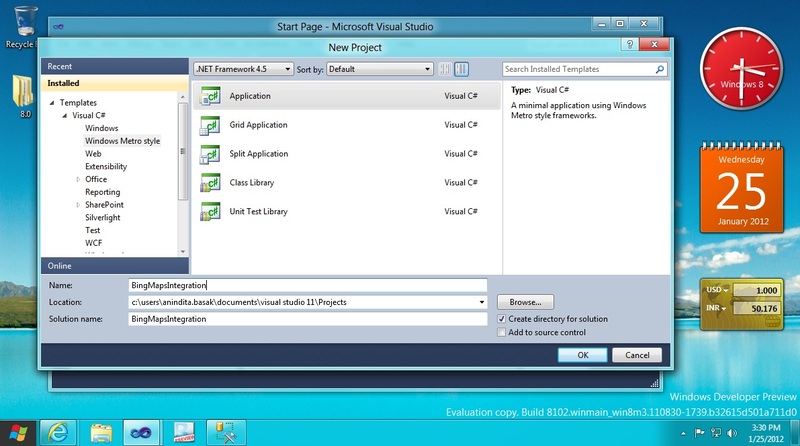 Lets start by creating a Metro Style Apps project in VS 11 Developer Preview. 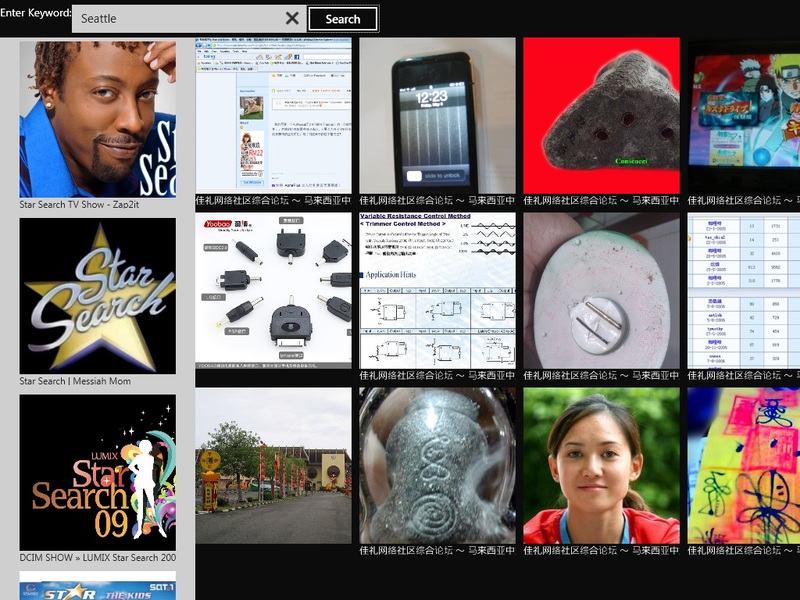 The complete Metro Style Apps with GridView in XAML consumed Live Bing API Feed in XML/JSON REST Services. 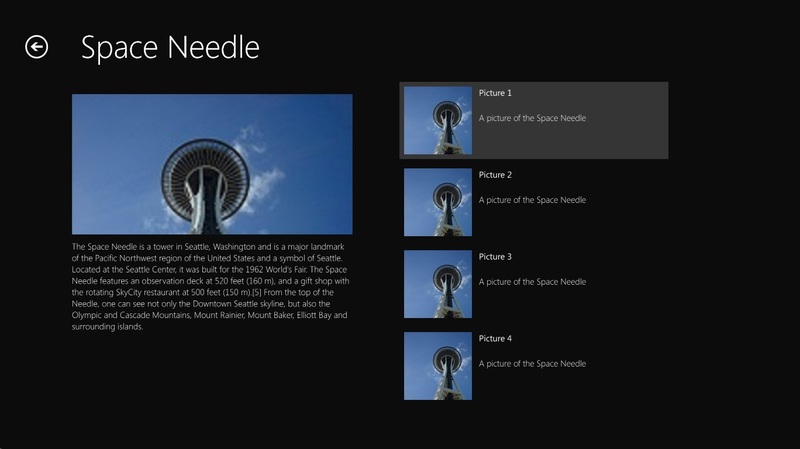 Formatted GridView in XAML 4.5 for Windows 8 Metro Style Apps. Development of Windows 8 Metro Style apps in Windows 8 Developer Preview is quite easy with the help of Visual Studio 11 Developer Preview or Visual Studio 11 Express Developer Preview(Available only with Windows 8 Developer Preview x64 with Windows SDK Tools). 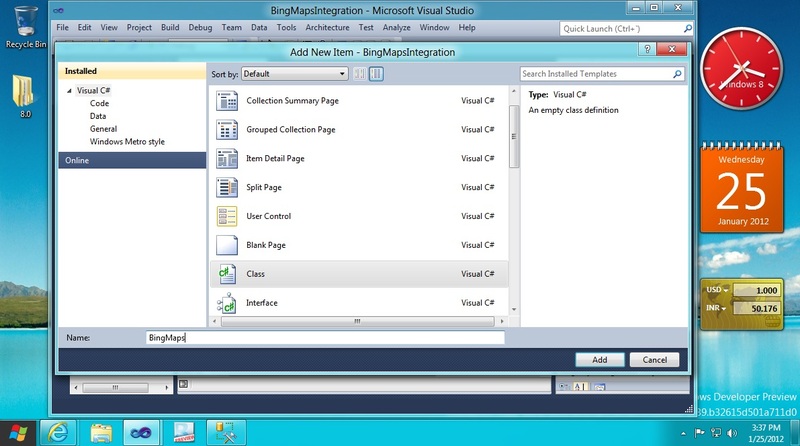 In Metro Style apps creation you will get option to create five types of applications in VS 11 developer preview templates. 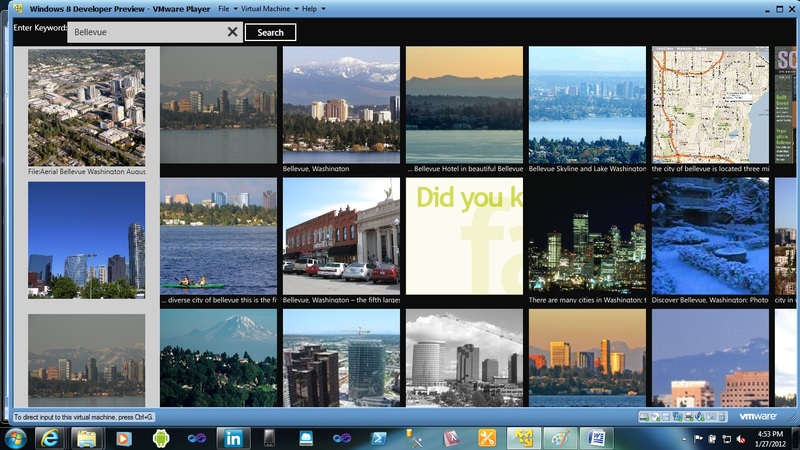 Next, we will create a Grid Application for Windows 8 Metro Style applications in XAML 4.5 to develop an PhotoViewer app. App.xaml: The Configuration file responsible for launch, Application Event Handling, Splash Screen handling. CollectionSummaryPage.xaml: This page is responsible for summing up ListView along with FlipViews with User Control Styles & Templates binding. DetailPage.xaml: The Page controls the basic UI binding of the Items retrieved from Service URL or local database. 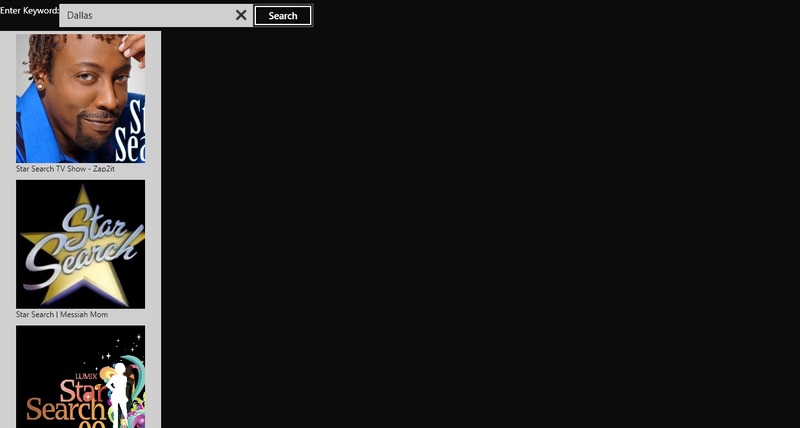 GroupCollectionPage.xaml: Responsible for UI layout & formatting. Package.appxmanifest: The overall configuration file of the app, responsible for logo designing & selection of Splash Screen, Logo of the Application, Device access capability, Code signing, Certificates & credentials control etc. Lets , I have added some Image files in the existing Images folder of the project & created a new file called PhotoDataSource.cs. 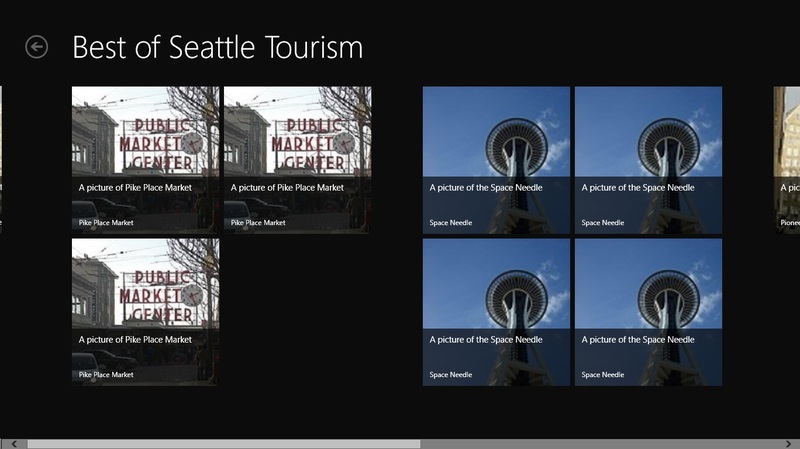 Lets check the PhotoViewer screen in Windows 8 Metro Style apps. 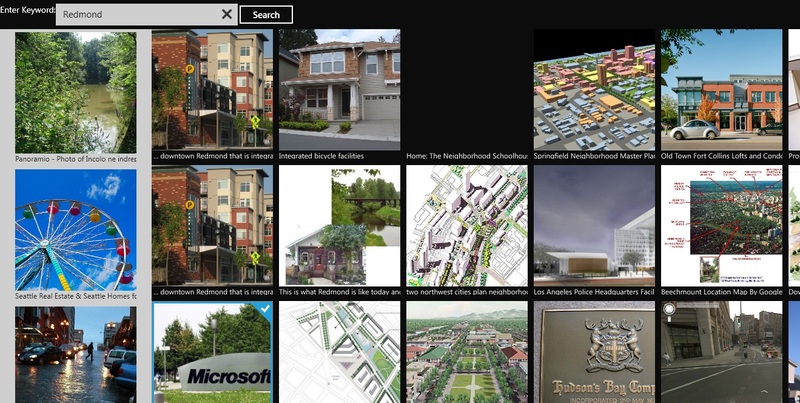 Next, Run the Metro Style Apps in Windows 8 Slate Simulator . Select it from VS 2011 developer Preview Debugging option pane. 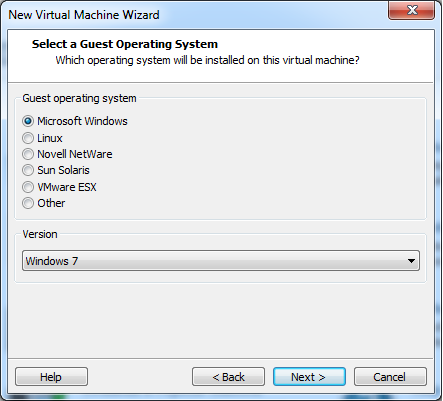 Start with selection of the installation media & be careful about the selection of the guest operating system. 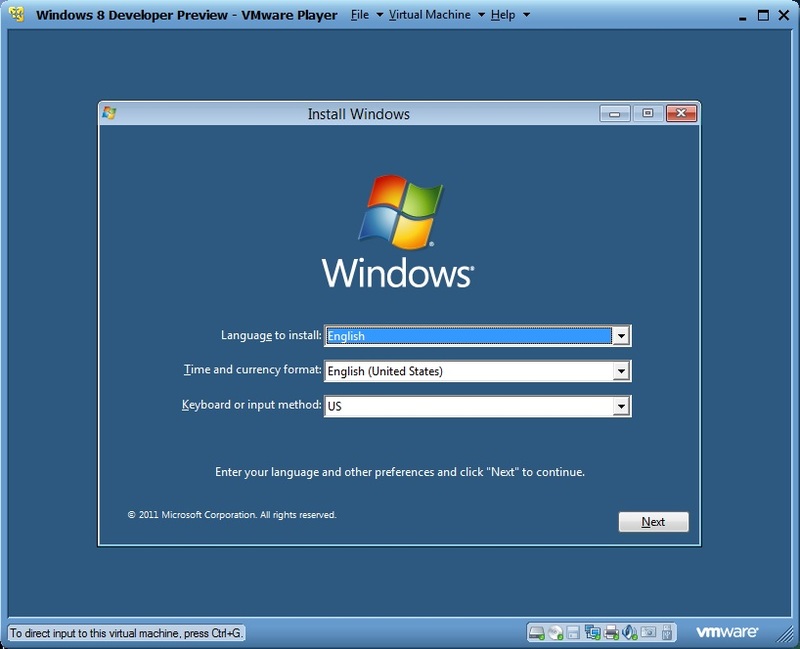 VMware still does not support Windows 8 so keep the name of guest os as Windows 7 (for 32 bit Windows 8) & Windows 7 x64 for 64 bit Windows 8 developer preview. Next, select the harddisk space requirements in VMware player & save the VHD as backup in your drive. 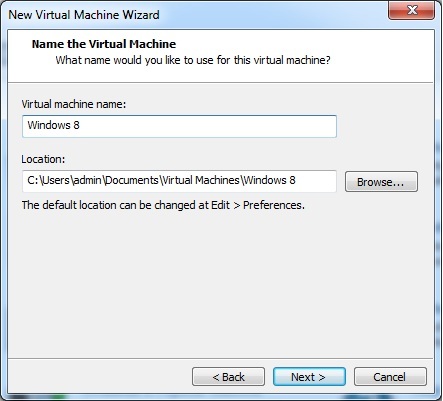 Start booting with Windows 8 developer preview once you finished the customization of VM settings. 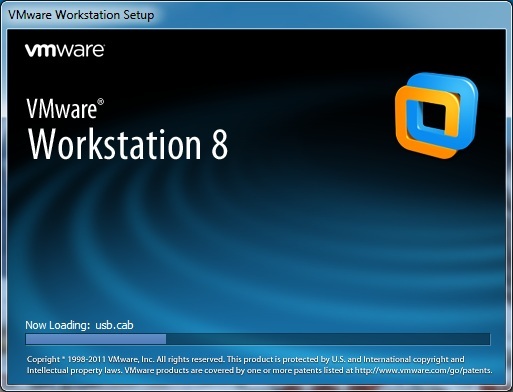 Next, setup the Windows 8 botting screen & populate with your Windows Live ID account. Check the final preparation screen of Windows 8 developer preview. 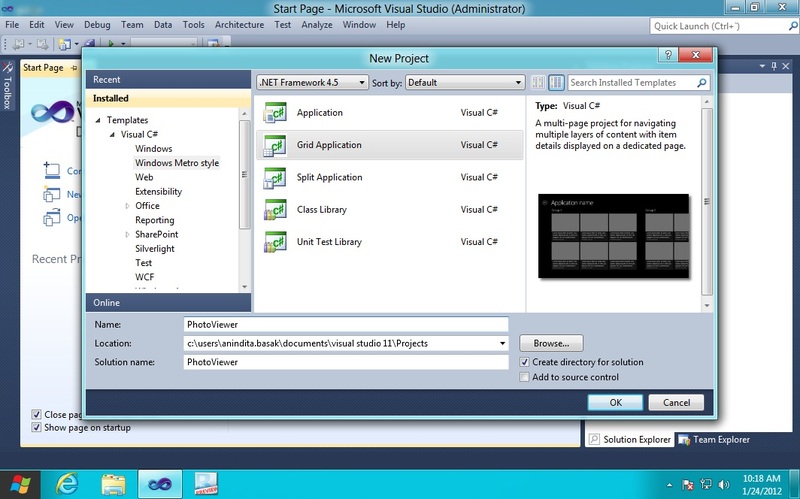 Install the Visual Studio 11 developer preview & start with Windows 8 Metro Style apps development. Lets check the VS 11 developer preview in Windows 8 Developer Preview.